Whenever I visit a new city/state, I always check to see if a tea room is in the area. I was disappointed when I learned the L.S. Ayres Tea Room was closed for renovation, but pleased to discover the Indianapolis Propylaeum. My son and daughter-in-law were very accommodating travelling companions, and took me to the Popylaeum - an Indianapolis-area club for women nestled in the beautiful Old Northside historic district. The house, built in 1891, combines many types of architecture. The walls are neo-Jacobean, the limestone columns on the veranda are Romanesque, and the double doors at the front entrance are Georgian. The general structural appearance is Queen Anne. Below is a two-sided historical marker installed in 2009 by the Indiana Historical Bureau. 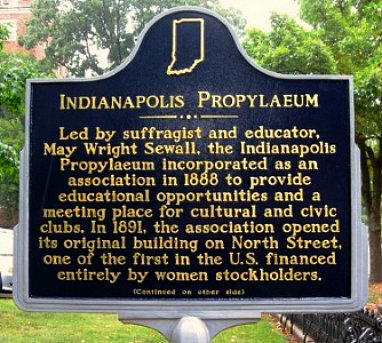 May Wright Seawall moved to Indianapolis from Wisconsin when she married, and founded a girls' school, which became one of the three leading girls' schools in Indianapolis. She was a prominent supporter of suffrage leaders Susan B. Anthony and Elizabeth Cady Stanton, and helped found the Indianapolis Equal Suffrage Society in 1878. The nineteenth amendment was ratified a month after her death in 1920. And for a Michigan connection, she was a member of Henry Ford's 1915 Peace Expedition. Propylaeum is a Greek word, meaning "gateway" - to culture. Their mission statement: "To emphasize a sense of civic responsibility and community services; to foster the love of literature, music, science, and the fine arts; and to provide women a social and cultural center." They serve an English tea every Tuesday, Wednesday and Thursday at 3:00 p.m. [for $18.00], but due to our convention schedule we could only do lunch on Friday. My tea choice was Papaya/Passion Fruit Black Tea. Steve ordered their Signature Grilled Cheese Sandwich - a blend of three cheeses and tomato on grilled Italian bread, and a cup of L.S. Ayres Tea Room Chicken Velvet Soup. Below is Stephanie - an Indianapolis transplant from Grand Rapids, Michigan who works at the Propylaeum. When she found out I was going to be blogging about our visit, she took me on a quick tour of the first floor of the house. Below is the room where we dined. I think it's referred to as the Tea Room. A gorgeous needlepoint wall hanging. 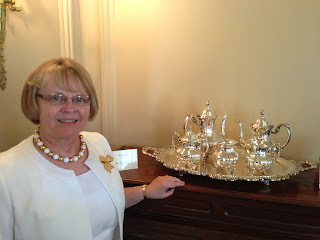 Beautiful silver tea accessories were in every room. 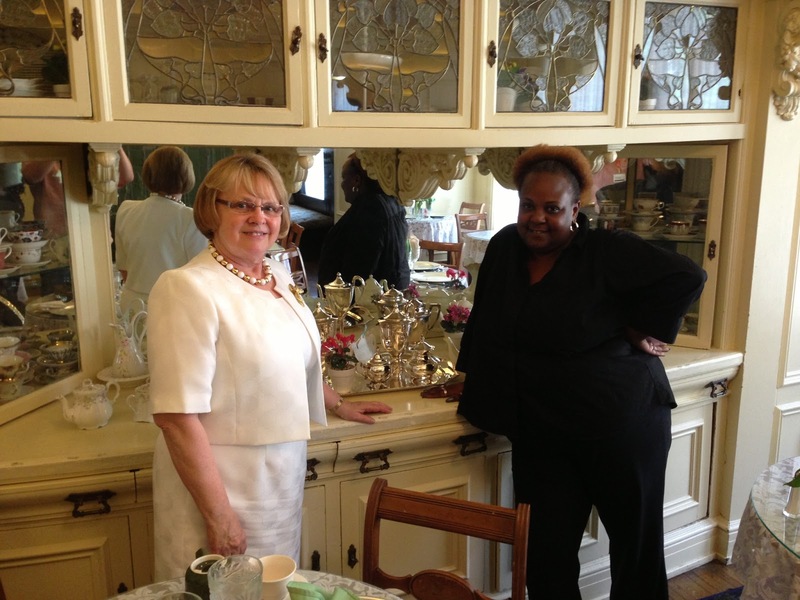 Pictured below on the mantle is a tea urn. The silver tea set below was sitting on an antique organ in another room. Unfortunately I didn't ask Stephanie the names of the rooms. Due to our time restraints, we couldn't tour the second and third floors. Maybe on our next visit. 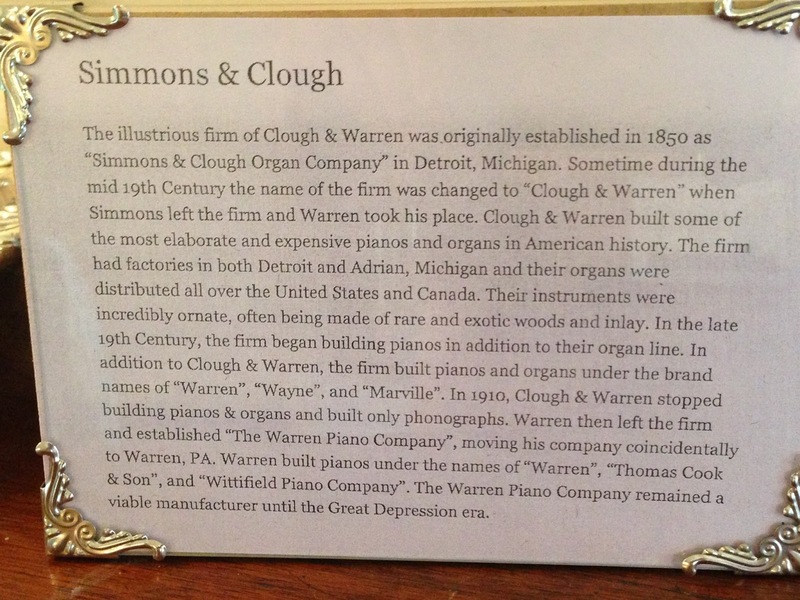 Sign telling about the organ's provenance. 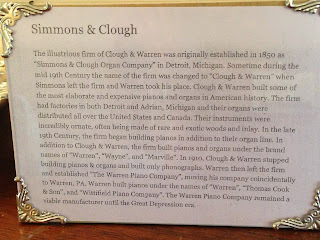 The manufacturer, Simmons & Clough, was located in Detroit, Michigan. My daughter-in-law, Sharon, and me. 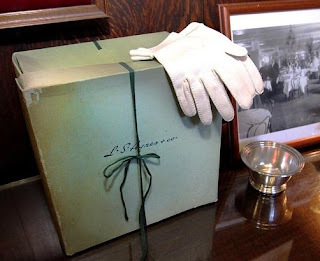 On May 1st of this year the Propylaeum hosted a luncheon celebrating Indy's late, great L.S. 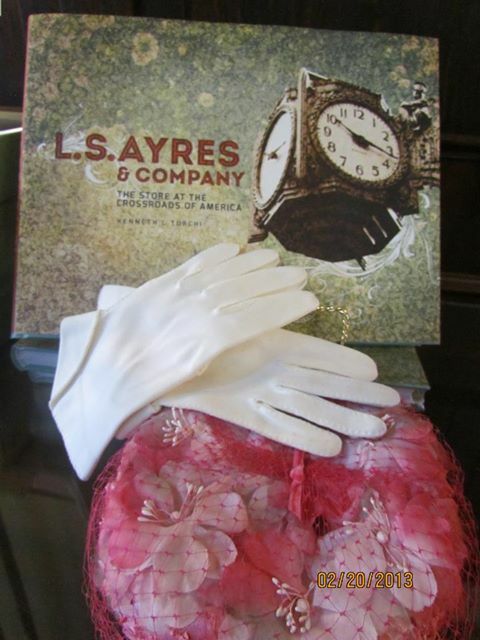 Ayres Department Store, and also to honor the fashion models who worked there. "Be sure to wear your hat and gloves - there will be a prize for the best 'Ayres Look'" declared an advertisement for the luncheon. A fashion show was part of the entertainment, as well as a May Sewall impersonator. I wish I could have attended the event. I would love to coordinate something like this in my area for the J.L. Hudson Department Store! One of the volunteers told me as I was leaving that they are working on The Largest Tea Party this fall at the fair grounds. 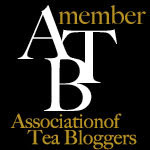 The cost will be $10 and attendees will bring their own teacup. I signed-up for their newsletter to get the details when they become available. 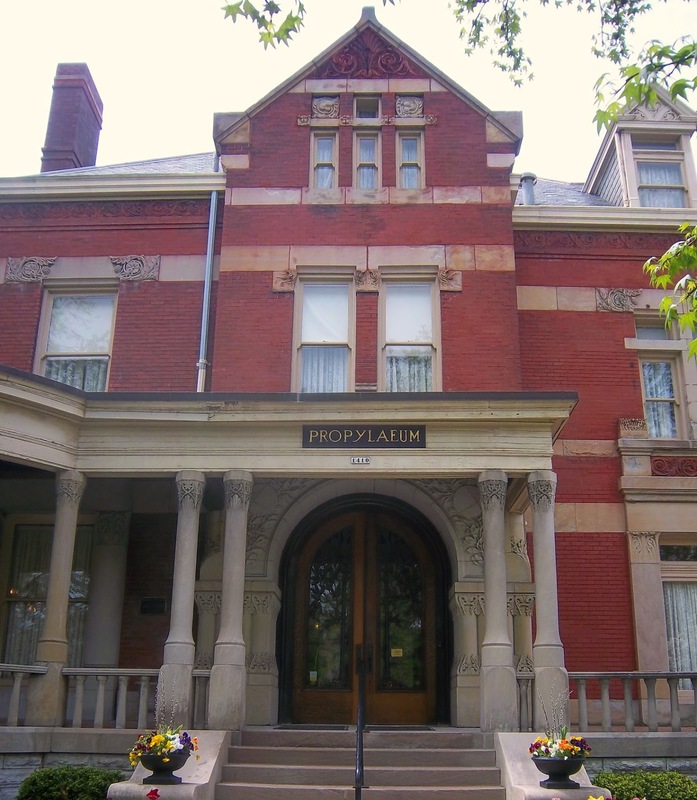 I thoroughly enjoyed visiting The Propylaeum, and will definitely go back the next time I'm in the area. I highly recommend lunch or Afternoon Tea there for anyone visiting Indianapolis. What an interesting place! I'm glad you shared the meaning of the name, that was a new word for me. I enjoyed seeing the mini-tour, and I hope you'll be able to go back for some of their future events. Your salad looks delicious and this sounds like a wonderful tea room to visit! So glad you found time to check it out on your trip! Isn't that a gorgeous place?! I visited there last May. Lovely! So glad you had the opportunity to visit here. What a wonderful place with so much history! So glad you got to go there! Back Home Again in Michigan! 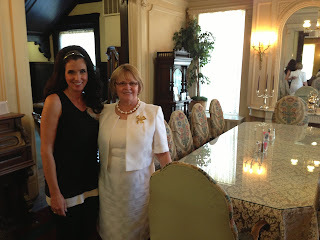 Celebrating Queen Elizabeth II...Over Tea!